Imagine this: yesterday, you spent some time searching online for holiday rentals in Paris. It’s an eerie feeling, knowing that your past activity online has a direct effect on the ads you’re seeing. In fact, it can be downright creepy. It creates a sense of unease, of privacy violated. How closely am I being watched online? As it turns out – a lot. In 2016, Google changed the way that it tracks people online by enabling a connection between a user’s online activity, and their personal identifying information. This radical move, which essentially removes your anonymity and privacy online, was criticized by consumer watchdog groups, but largely flew under the radar. With the creep of online ads, it’s crucial to stay informed about what is really going on in the world of targeted advertising, and what you can do to protect your privacy and reduce your risk of unwanted exposure. Online ads don’t just appear at random. Websites use tracking pixels that follow your online activity and collect data about the sites you visit and the content you read or view. They then use this data to serve you with ads that match your areas of interest. The data collected about you online can be quite comprehensive. Among other things, sites keep track of how much time you spent on a certain web page, and by using heat-maps they can even follow which parts of the page were more interesting to you. Advertisers use this specific data to ‘retarget’ ads. That means that if you were searching for Paris hotels yesterday, advertisers can retarget a relevant ad to you tomorrow; say, an ad about guided tours in France. With every click of an online ad, the advertiser pays the publisher. And that’s another reason why targeted ads are so valuable to all parties. Online advertising is big business. Global spend on digital advertising in 2017 reached close to $230 billion. With stakes like this, we’ll be sure to continue seeing more sophisticated approaches to targeted advertising. As the internet becomes more sophisticated and complex, so too online advertising. The first banner ad on the internet appeared in 1994. In the 25 years since, the internet has become overloaded with ads, and people are downright annoyed. According to statistics, 86% of consumers suffer from what is known as ‘banner blindness’, which means they don’t really see the ad. They consciously or unconsciously block it out, rendering it useless. In order to prevent ads even coming up in the first place, many people use ad blockers. It is estimated that ad blockers are currently installed on 615 million devices worldwide. In addition to being an irritation and unwanted distraction, ads also eat up bandwidth and memory, not to mention the risk posed by adware, malicious ads that attempt to infect the device or steal personal information. That’s not to say that online ads are all bad. Targeted ads have benefits too. If you’re planning a trip to France, it is helpful to see ads about things to do in Paris. For many people, the benefits of getting more personalized and relevant ads online outweigh the annoyance and risk posed by targeted advertising. All search engines provide an option for you to stop receiving personalized or targeted ads. You can choose to opt out of seeing ads on Google, Bing, Yahoo, and others, by going to the relevant settings page and selecting ‘opt out’. Search the Help Center in every browser you use to find the Opt Out page. You’ll still see ads, but they won’t be targeted, which means they’re not based on your personal data or online behavior. Google Ad Setting & Ad personalization. All search engines provide an ‘incognito’ mode. Incognito browsing is private browsing. It means that your browser will ignore cookies (which are used to track you online), even cookies for ad targeting. Make sure to switch to incognito mode in every browser you are using. And make sure to completely delete your past search history before going incognito. Then you’ll be searching privately with no past activity to analyze, and you can enjoy a truly targeted-ads-free experience. It’s not just search engines that track your online activity. Social networks such as Facebook are also watching everything you do online and targeting you with personalized ads on their site. Make sure to turn targeted advertising off in your social network accounts, so you won’t be used as fodder for advertisers. 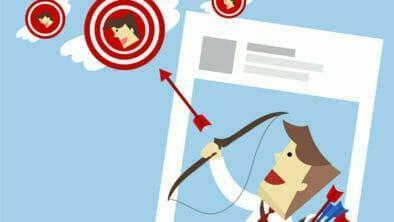 More info on Facebook ads setting and how to adjust how ads are targeted. VPN is a great way to avoid targeted ads. VPN, which stands for ‘Virtual Private Network’ enables you to access a remote server anonymously and privately, so the ad tracker won’t know who you are or what you’re doing online. What’s more, some VPNs offer a built-in ad blocker, which is a great two-for-one deal to help avoid online ads. Not only will you be fooling the personalized ad tracker by surfing anonymously, you’ll also be preventing non-targeted, spammy ads from appearing on your device at all. PureVPN and CyberGhost are two recommended VPNs that also provide ad blockers as part of their features package. The issue of online privacy is an urgent one. Europe is further ahead than other countries in attempting to regulate advertisers and protect users’ online rights. In fact, 2018 is the year that the GDPR comes into effect. The GDPR (General Data Protection Regulation) is a new privacy law affecting any business in the world that collects personal data from EU citizens. That includes search engines such as Google, social networks and thousands of other businesses. The GDPR is designed to put control of personal data back in the hands of the user. Under the GDPR, it will be much easier for you to know what personal data has been collected about you online, to request companies to delete that information, and to opt out of having your data collected at all. Penalties for non-compliance of the GDPR are steep – up to 4% of annual global revenue. If that’s not enough to convince companies to get serious about online privacy, nothing is. Until then, take control and follow the simple steps in this article to stop getting targeted ads once and for all.